My guide Peter and I stopped for tea at a biker joint in the middle of the desert in Nowhere, South Africa, and were chatting with the wizened proprietor behind the bar. He asked me where I was going next and when I told him he became very animated. “Ah, Bagamoyo! I love that town, so much history and interesting art and culture. 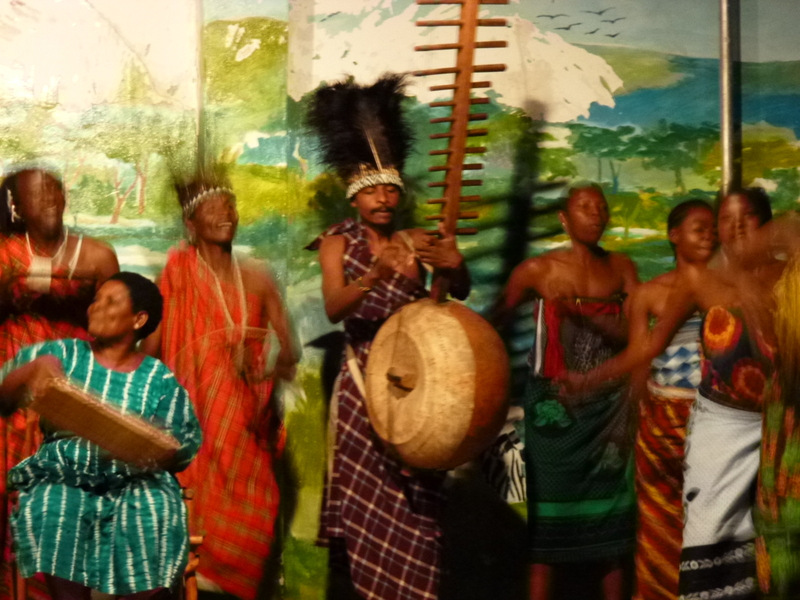 I worked in Dar-es-Salaam for several years but would escape up to Bagamoyo as often as I could.” It was a ringing endorsement from an unexpected source, and Bagamoyo has proven to be all he said and more. It’s Tanzania’s oldest town, officially founded in the late 1700s, but there are ruins of a mosque that date back to the 1200s. It was the original capital of German East Africa and a leading port for trade, a place where explorers geared up before heading to the interior of Africa in search of the source of the Nile, and where traders paused before taking ivory or slaves from the interior to Zanzibar. “Bwaga-moyo” means “lay down your heart,” which lends itself to multiple interpretations, but the one most embraced is “lay down your load” in honor of the porters who had labored so hard to get there. 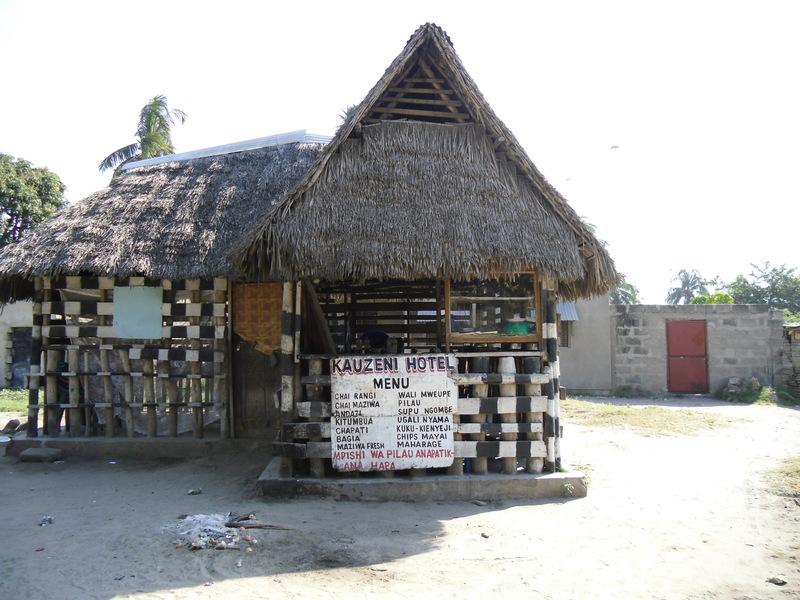 There are some 40,000 people living in Bagamoyo. It’s a fascinating mixture of cultures courtesy of Arab and Indian traders, German colonialists, Christian mercenaries and tribal Africans. It was once a great port, but no longer; while the southern tip of Zanzibar is directly off the coast of Bagamoyo, to get there by either boat or plane you have to drive south to Dar-es-Salaam before heading north again to Stone Town. But it appears that’s about to change. Ambitious plans are underway to expand the port, build an airport and upgrade the rail facility, all because “Dar” has become so congested as to be nearly unnavigable. There are only a few paved roads in Bagamoyo, but that will likely not be the case in a few years time. That’s progress one supposes, and it will enhance the quality of life for many people here, but it’s disappointing also, because Bagamoyo’s charm is in its lack of pretention. There are a few cars, a few more trucks and of course the dala dalas – the public transport buses – but many more bicycles and motorbikes and three-wheeled bajaji on the dusty, sandy streets. Especially Chinese-made motorcycles. At many street corners there will be five or six of them, the guys just hanging out, and initially I assumed it was evidence of a high unemployment rate or some rite of passage, but in fact these are Bagamoyo’s taxis, and for 1000 Tanzanian shillings, about 62 cents, they will take you anywhere in town. 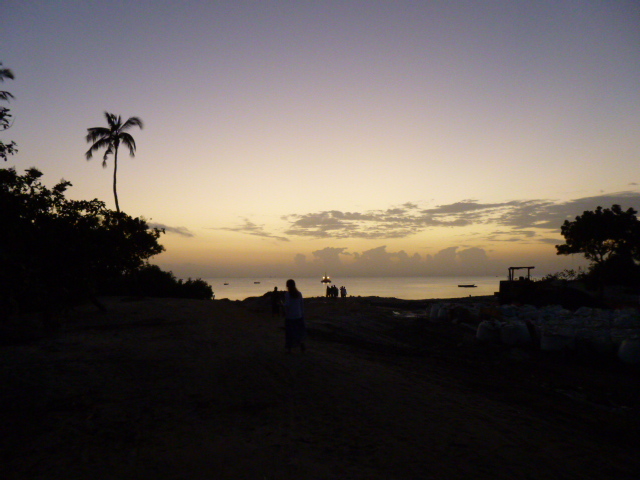 There is a wonderful beach and one or two decent beach hotels; a thriving fish market; a boat-building business that turns out the traditional sailing “dhows”; the oldest mosque and oldest Catholic church in Tanzania; a large, walled-in soccer field where we saw a fight break out between a fan and a game referee — in the middle of the game; a few government buildings and many shops. 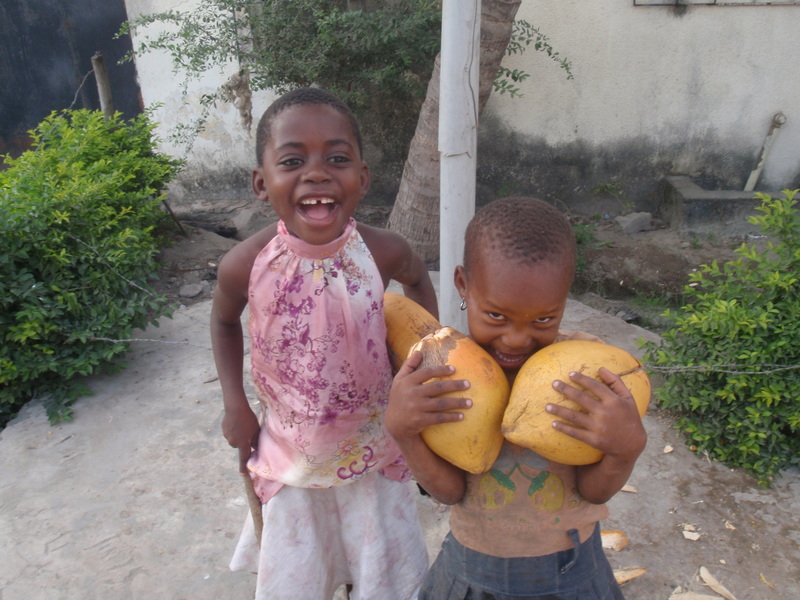 But what makes Bagamoyo special are the people, their smiles and their spirit and their stories. And more than anything this is an artist’s community, with an art college, an art market in the center of town that is everyone’s favorite place to hang out, and smaller art shops and galleries/studios/huts everywhere. The artists themselves are some of the most engaging people you could ever meet, and here are some of my favorites. His smile lights up the art market and beyond. Some people call him “Obama” because of that smile, others call him “Mchena”, because they think he has Chinese eyes. But most call him Idd, pronounced Idi, like Idi Amin. He explained to me that his first name has something to do with the end of Ramadan and the opportunity to eat again, but he really isn’t sure why his father gave it to him. He used to hang around the market when he was in school and he picked up some skills, and after his schooling he started painting full time, at first for a Rastafarian who had a shop nearby but who moved to Germany with his new wife, and now at the art market. His English is better than most of the guys, thanks to a former Cross-Cultural Solutions volunteer who taught him two years ago. Idd was born in Bagamoyo and when I asked about his childhood he would only say “it was not a good life.” His father goes to the beach now and buys fish from the fishermen, takes them home and fries them up, and takes the fried fish to sell at the market. His mother sells charcoal. When I bought a painting from him one day he was pleased he could now take his parents some rice, and his father some malaria medicine. His father cares for a young albino boy who was abandoned by his mother, a subject that almost brings Idd to tears. His dream, he says, is to “be a good painter, and to help people. You can’t live life just for money, then what do people say about you when you die? 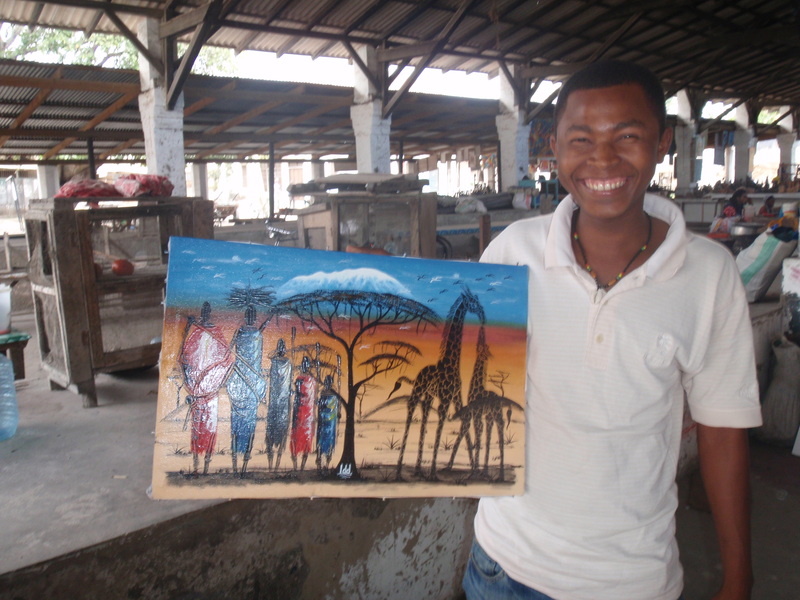 I want to help orphans, help make the new generation better.” I asked Idd to make a painting for me that depicted my first two weeks in Tanzania and included Kilimanjaro, Maasai warriors, an Acacia tree and some giraffes. When I told him I wanted Maasai and giraffes in the same painting he started laughing. I wasn’t an easy client. The guys tend to paint Kilimanjaro with a flat top, and while it may appear that way from some angles the Kilimanjaro I know has two peaks with a crater in the middle, and I wanted some elevation changes around the summit. Also, their acacia trees are skimpy; I was looking for one with a larger canopy at the top and smaller ones at descending levels. Idd nailed it, and I think he was happy so have branched out a bit. I asked him what everyone thinks of having Maasai and giraffes in the same painting. “Everyone likes it very much,” he said, with that killer smile and maybe a touch of pride. If you Wikipedia “Bagamoyo” and scroll way down you’ll find that the only “Notable Inhabitant” listed is Hukwe Zawose, which is remarkable in that the current president of Tanzania is from Bagamoyo. But Zawose, the former patriarch of a musical family renowned internationally for their interpretations of traditional African music, would certainly qualify as being more respected, if not more notable. Hukwe died in 2003, shortly after traveling with Peter Gabriel on his “Growing Up” tour. He was a master of the maremba, or the thumb piano, and appeared at music festivals all over the world. Since his death the family carries on the musical traditions he embraced, and even appeared in a film called “Throw Down Your Heart,” about American banjo player Bela Fleck and his travels through Africa. We first met the Zawose’s at home, in their family compound where they have a stage for rehearsals and a number of homes and almost as many children as chickens. Victor was our charming and animated host, introducing the instruments and the family members. It’s an exceptionally happy place and it was privilege to be there and to meet many of them and have them perform a couple of numbers. 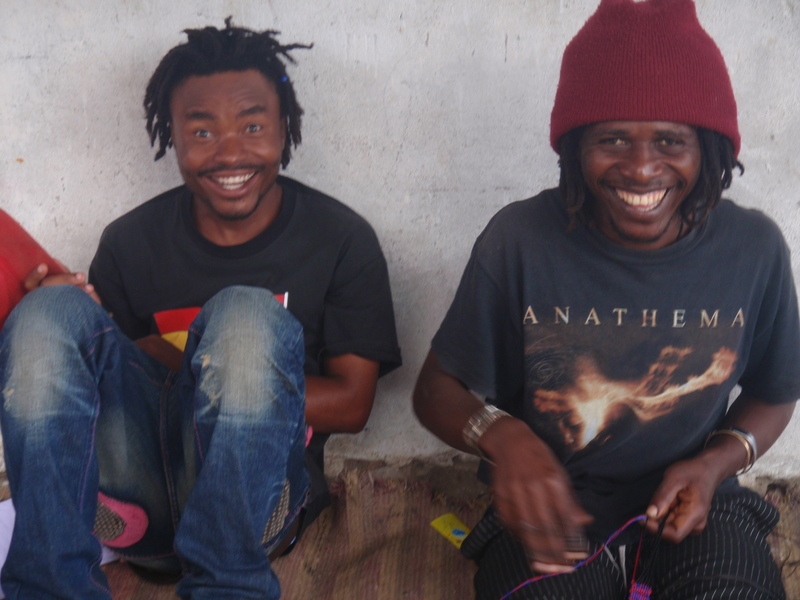 They make many of their own instruments and I bought a small maremba and one of their CDs. That night we went to a club called The Eagle’s Nest and the Zawose’s performed for real, with their unbridled passion and their authentic costumes made of goatskins and porcupine quills and headdresses of ostrich feathers. The women in particular are charismatic as they strut across the stage pounding furiously on drums squeezed between their legs, simultaneously dancing, banging, singing, laughing and making me wonder what I was doing over here working for an organization trying to empower Tanzanian women. The Zawose women are seriously empowered. Check out the Zawoses on youtube, and if you want to book them for a gig (they would love to come to America!) you can get in touch with Victor at vlolinga@yahoo.com. “Like king?” He doesn’t smile much, but his eyes do. He was born in Dar-es-Salaam and still lives there with his second wife, a tailor. His first wife, the mother of his eight-year-old daughter, died from a brain tumor. He commutes between Dar, Zanzibar and the Bagamoyo art market, where we met the first time I sat in on the artists’ afternoon English class. He was struggling and when I asked him the problem he just said: “Eyes.” It occurred to me that these guys have likely never had an eye exam much less anything corrective. I brought him an old pair of reading glasses the next day and they seemed to help. He has a fondness for beach scenes, with boats and fishermen and palm trees and colorful skies; it seems to fit with his placid and kind demeanor. That purple painting in his photograph is mine now. Down the road from the art market is a small shop where the power is out, not from some Tanzanian infrastructure issue as is often the case but because the bill hasn’t been paid. But the lads are unfazed. Their artwork lines the wall across the street, and they hang their t-shirts and clothing in the sun and work at tables in front of the store. Who needs power? They do it all: paintings, clothing and wonderful hand-made note cards. 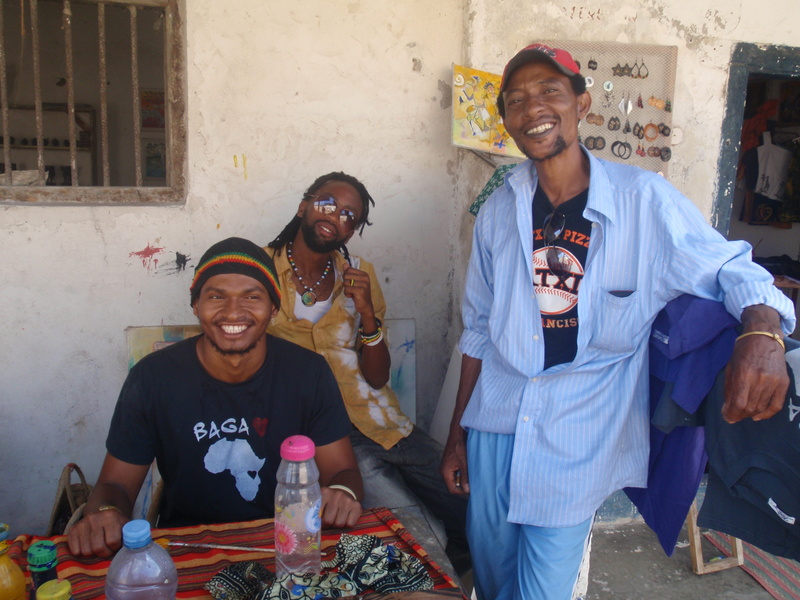 Sadick came up with a unique “I love Bagamoyo” logo and now you see his t-shirts all over town. He’s working on one for Tanzania, which should expand his reach. John Shoghollo was a teacher of the other three at the art college, and now seems to be kind of a partner in the store. He does Dali-esque paintings of elephants and tusks and hunters that reflect how he feels about the ivory trade and the senseless killing of elephants that still goes on. “You should do one of these with rhino,” I told him. And maybe throw in a few Maasai. 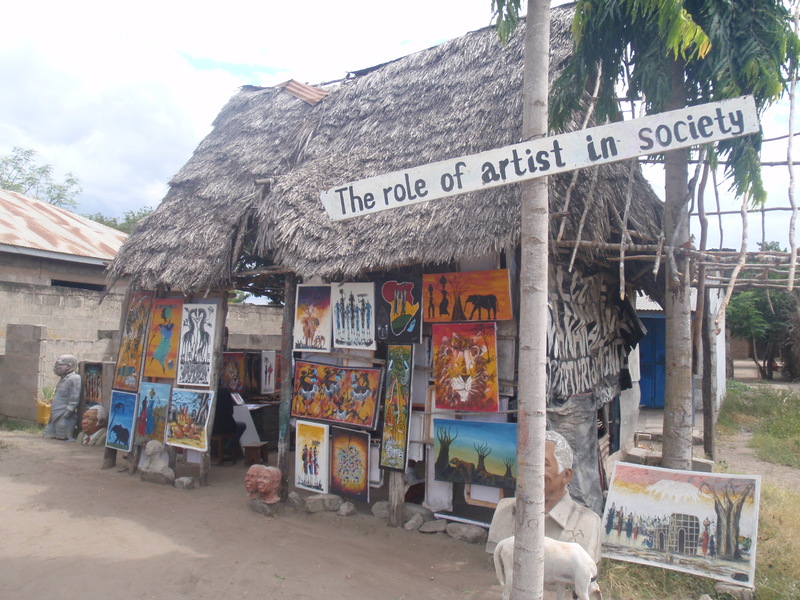 Saidi is a product of the art culture in Bagamoyo, having attended the art college here, and after that taught carving and painting, but his calling at the moment is AMAP, a school that started out as the African Modern Art Program but is now educating younger kids in academics at a level most families have to pay for. 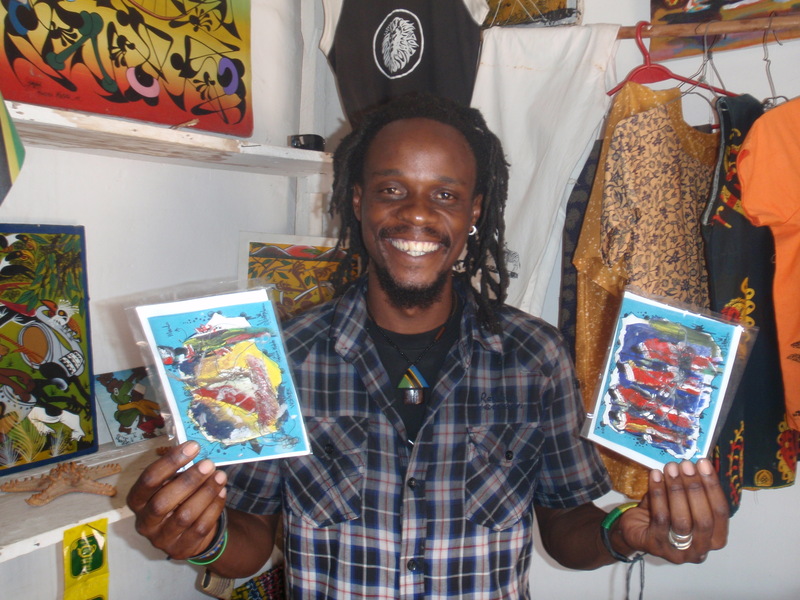 He is from Dar-es-Salaam and started his career as a cartoonist for a newspaper there, but came to Bagamoyo in 1999 for one year of schooling. A British benefactor invited him to the UK twice, and the second time he stayed in Wales for three months where he participated in a Festival of African Art. Over time he developed the idea for the African Modern Art Program, which has evolved into a school for 85 kids ages 4-10. They pay nothing. Saidi covers their supplies and uniforms and pays the teachers, mostly from donations. 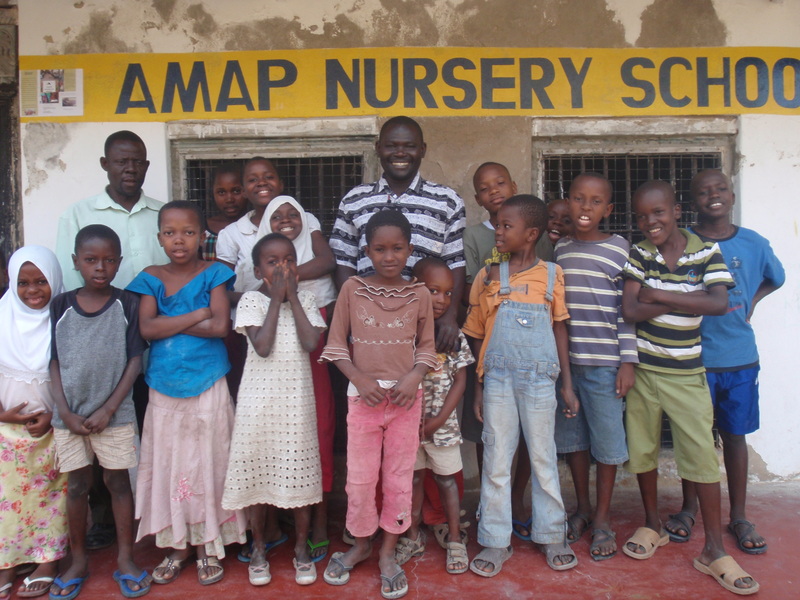 His wife, Pili, is a seamstress with a shop nearby and she donates 10% of her profits to AMAP. The school opened this year and already he has been able to send 45 kids on to primary school. The school is in a crumbling building with no electricity or plumbing. The walls are decaying rapidly and some young ROTC cadets from our volunteer team worked for two weeks patching them with concrete so they wouldn’t cave in and could be painted white to keep the room from being more dungeon than classroom. “It’s like building a vertical sidewalk,” one of them said. But the room is white now, and brighter, and soon will have the alphabet and numbers added to its perimeter. Between raising money and carving, painting and cartooning, and teaching the kids art one day a week and older kids in the evening, Saidi has managed to finish a book that he hopes to get published so the proceeds can go to AMAP. It has nothing to do with either art or education. He writes – with great passion I can only assume from our conversations – about governmental corruption in east Africa, how the leaders care only about lining their own pockets and their big cars and houses. “We have so much security with the police and the army and still people bring in cocaine and guns,” he says. “Why do you think that is? If we don’t get leaders who care about the people, in the future it will be ‘janga’ … disaster.” He’s trying to get some financial support to get the book translated from Swalihi to English, and then published. Political corruption is a very common topic of conversation here, as elsewhere in Africa. They call Jakaya Mrisho Kikuete of Tanzania “The Flying President” because he jets around the world to this event and that and is never here. A few people from the government have been fired recently for corruption but that’s seen as token, and nothing really changes. The walls in Saidi’s school continue to crumble, and he continues to do everything he can to keep them upright and to raise money and keep the kids in class, three to a desk. Jack, always good to hear from you. Sometimes I think I’m doing this blog in a vacuum so it’s good to know someone is out there! I agree with you, I would love to rep these guys in the U.S., their work is so colorful and unique. And incredibly cheap! 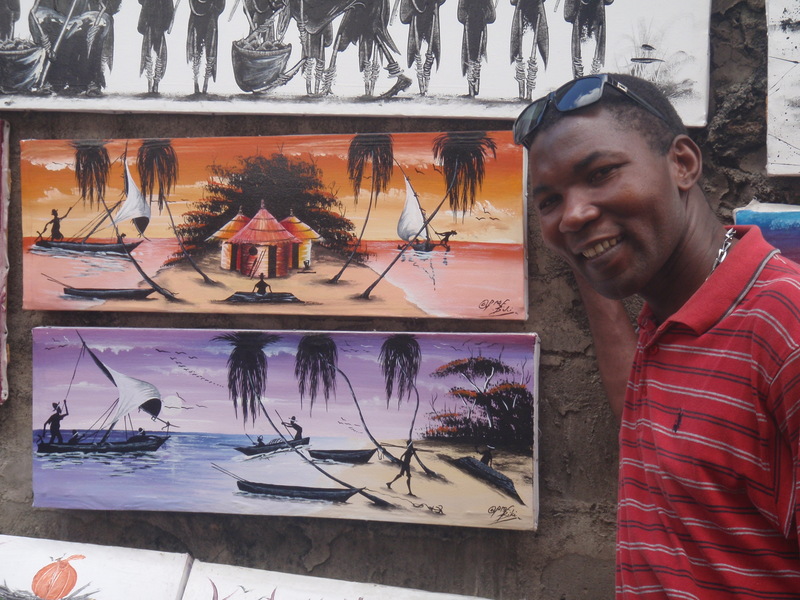 The painting I bought form Biki was 30,000 Tanzanian shillings … about $20. Idd wanted to charge me 60,000 for the one he did on commission but I gave him 80. I’m teaching the guys English but also business skills. They are a joy to be around. All the best to you both, and thanks so much for your comments! you’re doing amazing things and writing amazing posts. Just an incredible journey and log. Sandy and I have our maps out and we’re definitely enjoying being along for the ride. Ruffin, do you have any idea about how we (Sandy and I) could buy some of this artwork? And we (you, I and others) shouldn’t give up on importing this work. We’ll keep it in mind and discuss after you return. Ruffin, I cannot tell you how much I have enjoyed reading about your travels. Thank you for allowing me to be a part of your journey, and the story of those you have met. Hi Ruffin. Loved this post although it made me even sadder to think about CCS closing and the impact that will have on all the people you’ve written about. I agree it would be great to get this artwork out to the States and Eu. Happy to help if I can! And I really hope Saidi’s book gets published, sounds fascinating. Safe travels and keep writing. We love it! Tamsin, thanks for checking in! Not sure if I told you but Zik got some good news this week about some additional volunteers that will keep the place open through November, and we can all hope for the best beyond that. I’m back in Zanzibar, heavy wind and torrential rains this morning, wasn’t sure the ferry would even operate, but it’s clearing up. Stone Town is very interesting when you’re not on a tour … I’ve had at least a dozen people try to sell me weed. All the very best, and thanks for keeping in touch! Ruffin, I was told about your blog via another CCS volunteer that just got back to US. I hope you don’t mind my looking in. Have only read this post so far, but such great observations and comments! I will be one of those volunteers starting on Sep 1. Will you still be there? My name is Kay. It would be great to meet you.